Price Match Seen it at a lower price but prefer to deal with us? Email to see if we can match the offer! La Chocolatière, perfect for making a delicious cup of drinking chocolate. Use real chocolate flakes or instant powder, for a delicious frothy drinking chocloate, hot or cold. 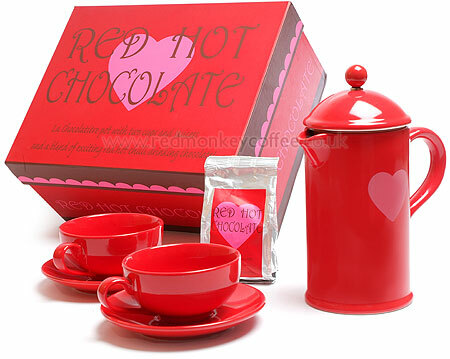 Gift set includes an 8 cup Chocolatière pot and, matching cups and saucers and a sachet of chilli drinking chocolate! Mmmmm. Perfect gift for the Chilli lover or from the Chilli lover! NOW OUT OF STOCK, Sorry. Prices include FREE UK Delivery by 1st Class Royal Mail / Courier.